Mexico, in addition to its beautiful landscapes and fascinating culture, has a culinary tradition worthy of recognition. Each region has dishes that represent it and the Riviera Maya is no exception, thanks to the legacy that the pre-Hispanic civilizations left, with base ingredients such as cocoa and corn, to which they found an infinite variety of ways to enjoy them. 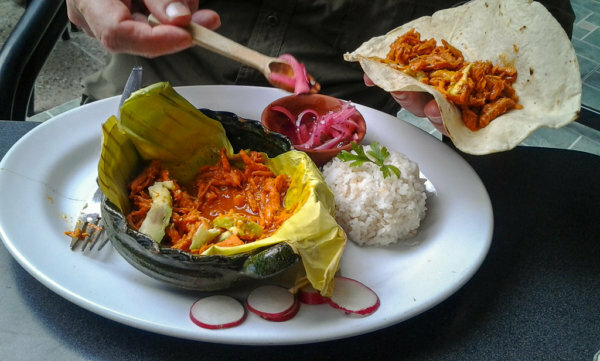 Among the main Yucatecan delicacies are salbutes, panuchos, papadzules, lime soup, polcanes, black stuffing and cochinita pibil, the latter is the best-known dish nationally and internationally, consisting of pork marinated in achiote and baked in a banana leaf, accompanied by red onion in sour orange and habanero pepper. Formerly the Mayans cooked it in an underground oven, now it can be prepared in a conventional oven and letting it marinate overnight. Give it a try and taste it, here we share the traditional recipe of cochinita pibil. Take into account that it should be left to rest all night and that it is for 18 servings. Grill chiles, garlic, cinnamon, pepper, cumin, and oregano separately. Soak the chiles for 20 minutes in hot water until they soften and drain. Roast the banana leaves over the fire to soften them. Place 1 sheet in the bottom of a saucepan and place the pieces of meat on top. Blend the soaked chilies with the garlic, cinnamon, pepper, cumin, and oregano, as well as achiote, orange juice, salt and oil. Pour the mixture over the meat and cover with the other banana leaf. Let marinate in the refrigerator overnight. Cook the meat between 3 and 4 hours on low heat until it is very soft. Remove the meat from the saucepan and finely shred it. Discard the banana leaves and return the meat to the fire, cook without lid for 20 minutes. Serve with purple onion slices marinated in lime juice. Share if you liked this recipe and your comments about it, and enjoy this delight!